Welcome to Personal Ponies Ltd., Inc. of Boca Raton, FL. 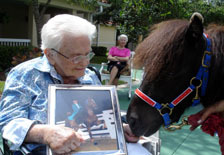 Personal Ponies Ltd., Inc. is part of a unique national 501(c)(3) non-profit charity dedicated to providing pony visits to hospitals, schools with exceptional education programs, nursing homes, veteran hospitals, and learning centers such as EASTER SEALS AND ARC- anywhere our ponies special touch is needed. 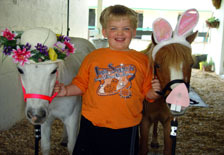 Personal Ponies also provides site "farm" visits to groups such as JARC and Gold Coast Down Syndrome Association which enables them to spend special "Therapeutic Pony Time". 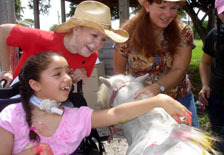 Almost every day of the year, children of all ages with special needs benefit from individual sessions at a 5 acre private farm located in Boca Raton, FL. 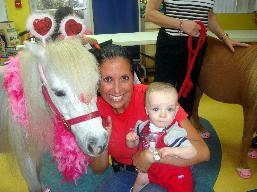 Throughout the year, there are many opportunities to get involved with Personal Ponies. Please browse our Web site to learn more about the ways we assist our community - and how you can help! Volunteers are always welcomed! PERSONAL PONIES wishes to acknowledge that while "disabled" is the most commonly used word to describe children and adults whose abilities may be different, we believe that it carries a negative tone--implying that our children are NOT-able. We much prefer terms like "DIFFERENTLY-ABLED" "SPECIAL NEEDS," and "HANDI-CAPABLE" because they more accurately reflect the truth: that while the children we serve may have SPECIAL NEEDS, they are ABLE to do many, many things. If you have any questions, you can reach us by clicking Contact Us. We welcome you to join us in this important mission!